Since June, I’ve been training for the Twin Cities Marathon in October, my second marathon. Pain in my arches and tight calves have made the training challenging at times. With shoe inserts and foot exercises, it’s been getting better each day. Yesterday, I ran 18 miles and felt great, even today. Following the training plan, doing foot exercises, yoga and massage has helped me get stronger over time. 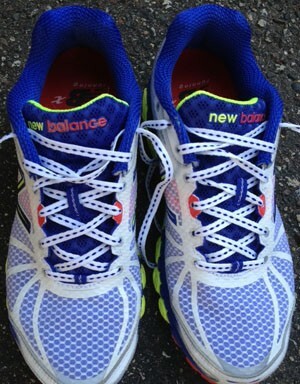 Yesterday, when I went to get new shoes and a gait analysis, I got new lighter shoes and no need for inserts. Putting in the mileage mixed with rest has paid off. Progress is made in steps but made visible in miles. The mix of struggle, frustration, effort and consistency produces resilience, endurance and results. Work works. Today I thought of the quote from Ernest Hemingway’s The Sun Also Rises – “How did you go bankrupt? Two ways. Gradually, then suddenly.” I think this applies to both loss and gain. Each day, what we do or don’t do leads us either to loss or gain, gradually, then suddenly. So get to work on your life, relationships, goals, dreams every single day and suddenly it will pay off. Enjoy each step, put yourself completely into the journey and the destination will arrive. Good stuff! I’ve been thinking about getting my feet professionally looked at. Let me know how the new shoes pay off! Get a gait analysis – only one good person in Minnesota – Wendy at Gear West. Lots of miles to the marathon but looking forward to it.